NETWORK FINALS: OLYMPICS coverage gained 0.1 in final numbers. CABLE HIGHLIGHTS: RIO SUMMER OLYMPICS coverage was at the top of Wednesday cable as well, with NBC Sports Net’s primetime telecast at 0.68, CNBC at 0.25, USA at 0.17, and Bravo at 0.05. OWN’s GREENLEAF ticked up to 0.65. Lifetime’s LITTLE WOMEN shows were down a tick to 0.55 in ATLANTA and down 0.08 to 0.54 in LA. On MTV, two episodes of CATFISH were at 0.49/0.44. 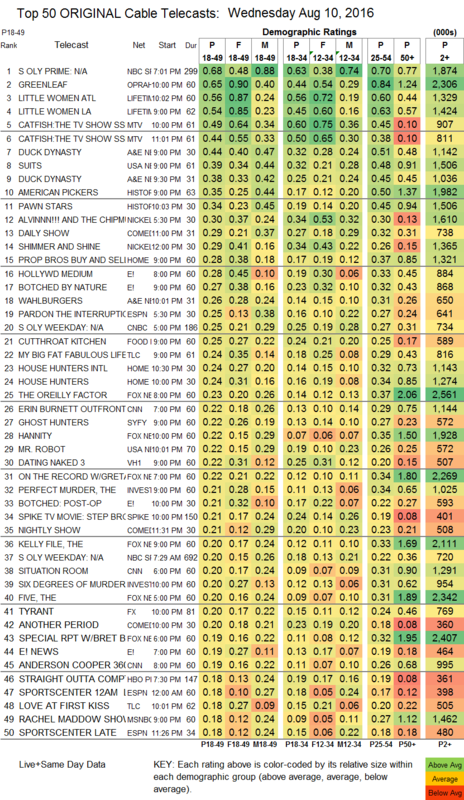 On A&E, DUCK DYNASTY was at 0.44/0.38, compared to last week’s 0.44/0.40, WAHLBURGERS was down 0.05 to 0.26, and BLACK & WHITE was up a hundredth to 0.10. USA’s SUITS took a 0.15 hit to 0.39, and that didn’t help one of the strangest episodes of MR ROBOT to date, down 0.02 to 0.22. History’s AMERICAN PICKERS lost a tick to 0.35, and PAWN STARS was down 0.07 to 0.34. On HGTV, PROPERTY BROS fell 0.08 to 0.28, HOUSE HUNTERS INTL was down 0.13 to 0.24, and HOUSE HUNTERS was down 0.14 to 0.24. 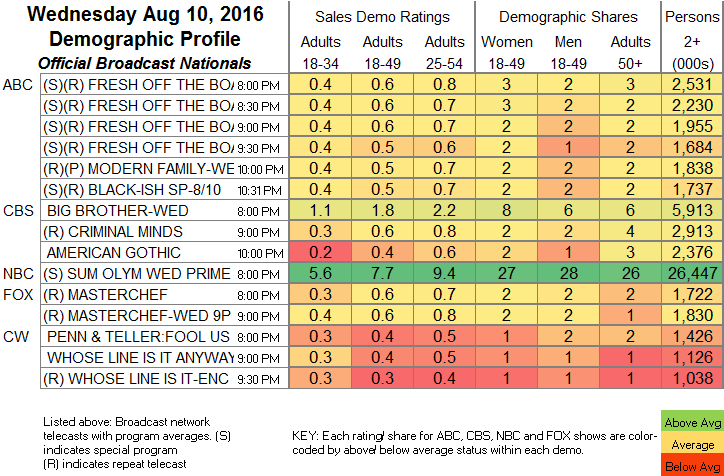 On E!, HOLLYWOOD MEDIUM was at 0.28, and BOTCHED BY NATURE dipped 0.04 to 0.27. Food Network’s CUTTHROAT KITCHEN rose 0.04 to 0.25. On TLC, MY BIG FAT FABULOUS LIFE dropped 0.05 to 0.24, and LOVE AT FIRST KISS was down 0.04 to 0.18. On Syfy, GHOST HUNTERS was down 0.05 to 0.21, and PARANORMAL WITNESS dropped 0.07 to 0.13. VH1’s DATING NAKED was steady at 0.22. FX’s TYRANT edged down 0.02 to 0.20. Comedy Central’s ANOTHER PERIOD gained 0.02 to 0.20. HBO’s ANY GIVEN WEDNESDAY ticked up to 0.14. Sundance’s THE A WORD gained 0.01 to 0.02/53K. Note: Cartoon Network listed STEVEN UNIVERSE as a rerun last night, but people have written in to dispute that, and it rated like an original episode at 0.40/1.569M.